With all the global warming issues, we should start to reduce using plastic. I know it's hard to definitely use no plastic when you shop. There is a time when you forget to bring your own shopping bag, may be the shopping bag which you have brought is not enough for all your things. But it's not hard to find a way to reuse the plastic. Usually we use it as a garbage bag, for the clothes when we travel, plus when we want to vomit we will use it. Hey, it's not enough! 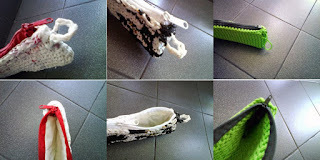 Now I tried to use this material (they called it "plarn", or a plastic yarn) and if you're wondering how to make it, try this. 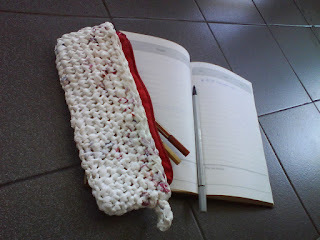 You can make everything using this plarn, but I chose to make a pencil case since it's easy and finish in no time. Thanks a lot for the one who invent this plarn. Two more plastic grocery bags crochet pencil cases. As you can see, the white one is bigger than the mixed-black-and-white. The plastic cutting was different, though. Also, this one is not made from plarn, it's chord. 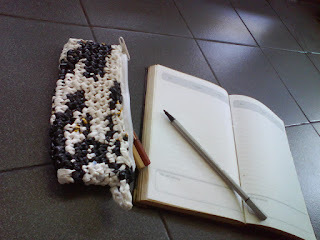 And this one is the abandoned pencil case project. Here's the detail look of the pencil cases. If I have more time (countdown for my college days), I would love to make some others. There are loads of things I want to make. I know this one is a good idea, but I won't make it, probably. Happy Holiday to you! If you're interested with my works, and maybe you want to have it, if you lucky I will give it to you for free. I love those pencil cases! My daughter needs one for 4th grade. Very cool. you can try to make it. it's easy. 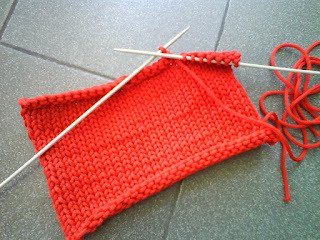 eh apa bedanya crochet ama knitting ya? jelasin donk..
crochet itu merajut kan ya? 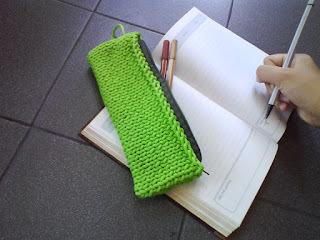 kalo crochet nama lainnya hakken, pake jarum kait, 1 doang. biasanya mereknya tulip kalo beli di pasar. biasanya ibu2 kalo rajin buat taplak.